President Paul Kagame has said that only Rwandans can have the right to define who they want to be and work towards that and only them have that freedom to make such choices but not foreigners, intruders, the press or rights groups. Speaking at the opening of the 9th National Dialogue (Umushyikirano) at the Parliamentary buildings today, President Kagame called on Rwandans to stand up and defend themselves against intruders who assume the responsibility of defining who they should be and what should define their country. In a powerful speech, President Kagame came out strongly against the critics who usually say that despite economic progress, there are no rights and freedoms of expressions and democracy in Rwanda, observing that it is a responsibility of Rwandans to say whether such rights exist or not. Addressing a full house of central government leaders, local government leaders, private sector and civil society representatives, religious leaders and diplomatic corps, President Kagame said that it is disturbing when foreigners, who sometimes don’t fulfill the lessons they teach others, ignore the progress made and instead start pointing accusing fingers, calling upon Rwandans to reject this patronizing attitude. Amidst applause, the Head of State pointed out that Rwandans should find it offensive for such critics to undermine the home grown solutions such as the National Dialogue to instead accuse countries of stamping on freedoms. He said that the objective of initiatives such as the Dialogue is to ensure that all Rwandans have a platform to participate and play a central role in the development and decision making processes of their country but such are never recognised. “Thirdly, probably you might not be dumb or no one is silencing you but you have nothing to say. Today, I want us to find an answer to this question, to assess what other people think we are and then come up with a stand of who we want to be, regardless of what other people think of us. Whoever considers us to be whatever, that’s their burden,” President Kagame said. The Head of State wondered why people talk of the economy growing but cannot put in perspective other aspects such as democratic processes, freedoms of speech and other rights which Rwandans have defined and put in place themselves along with the economic development that is visible but continue to complain about space. “Which space is bigger than this one?” President Kagame said in reference to the dialogue itself. “In fact the space that is lacking is that space which is constantly being occupied by those intruders. This nonsense from outsiders is the one occupying our freedom. These so called teachers of freedom, space, the same people getting stuck with genocidaires murderers and criminals,” he said, pointing out the case of Theoneste Bagosora, the genocide mastermind whose sentence was on Wednesday reduced from life to 35 years by the International Criminal Tribunal of Rwanda (ICTR). “It has taken them 17 years to try him and try him so badly and they are the same people coming here to give us press freedoms? You are a joker. Some of us you come to teach about freedoms have been freedom fighters for their and other peoples rights since childhood. We have interest in our own freedoms and rights than anyone else has. 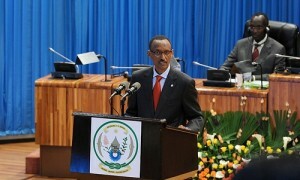 We have that responsibility more that anyone else,” President Kagame said. President Kagame said such people can do it, just because they can but not becuase they are right. “They can do it to Africans, they want to do it to Rwandans but I want to assure you that we are different people. You Rwandans sitting here should not accept this nonsense. Accepting it is unthinkable, but accepting it is worse off for you, stand up and defend that right, they should not speak for you,” he said. The Head of State took a swipe at rights groups and the media, saying that the two should not be the ones to be seen to have the right to define or choose what Rwandans want and also make freedoms appear like a myth where only a few have the power and previlege to define them and know what suits others. “My question is, who are you? Who are you speaking for? Are these millions of Rwandans here waiting for you to come and tell them what their interests should be and what their rights are? You Rwandans should reject that. We cannot make this progress and then at the same time fail in other areas, it doesn’t just add up,” he said. The Head of State said that he was recently reading a foreign newspaper where a certain person wrote that they cannot be governed by a minority several years after the country failed to form a government, observing that such a statement comes out wishful thinking because Rwanda is not governed by a minority but rather Rwandans. “They wish to be governed like Rwanda, these are people who havent been governed for two years, they failed to put in place a government. “The main problem is just one and thats what brings us here, they can afford to call us all sorts of names, they can do whatever they want— and they can do anything, ask where Mutara Rudahigwa went, they will do that because you depend on them, they give you remains, when you depend on them, anything will happen. Even passersby will poke at you, that’s the position we are in, that’s the position we want to live far behind us and that’s why we are here,” he added. He called on Rwandans to be more determined than ever to be in the position they want to be and end being in the position of being beggars and that will be the only way Rwandans will be independent of such negative references. In memory of the millions of victims of the Rwandan army in D.R. Congo. This is the ceremony of lighting candles during the memorial event held in Oxford House in London on Saturday 26th November 2011. Jean Pierre experienced the killing of his parents in Congo jungle by the Rwandan army when he was a young boy. He said that his life has changed forever since that day. He presented his testimony during a memorial event held in London on 26th November 2011. Here is a testimony of a survivor of RPF atrocities Gerturde Uwamariya, read during the Commemoration of 15th Anniversary of Rwandan refugees massacres in Congo held in Oxford House in London on Saturday 26th November 2011. London 26/11/2011 — Remembering Victims of RPF atrocities in Congo (ex-Zaire): Presentation of Olivier Harerimana. In 1996, the Rwandan army of General Paul Kagame attacked refugee camps in D.R. Congo and started systematic and widespread killings of Rwandan (Hutu) and Congolese populations in what the United Nations’ Mapping Report described in October 2010 as possible genocide against Hutus. Olivier describes briefly the horrible hutu hunting in the Congolese jungle. Former RPF officer and Former Rwandan Ambassador to US, Dr Theogene Rudasingwa, talks about truth and reconciliation in Rwanda. This was done during the “Rwanda Truth and Reconciliation: The Process Begins” conference organised by the William Mitchell College of Law on 28 November 2011. Paul Rusesabagina, president of the Hotel Rwanda Rusesabagina Foundation and author of “An Ordinary Man,” talks briefly about some important issues in Rwanda. In this video, you watch and listen to Mark Pursey, head of public relations BTP Advisers, saying that they created an internet “attack site” for the government of Rwanda over accusations it had been involved in genocide. Mark Pursey, head of BTP Advisers, was secretly recorded saying that the site was targeted at people who “over-criticised” over “who did what in the genocide”. A 2009 report from the Commonwealth Human Rights Initiative said Rwanda’s “excellent public relations machinery” had succeeded in hiding “the exclusionary and repressive nature of the regime”. Mr Pursey, who was the voluntary head of the Liberal Democrats’ National Media Intelligence Unit during the 2010 election, suggested his firm could create a similar site for the Uzbeks – who were in fact undercover reporters working for the Bureau of Investigative Journalism. Such a site, he added, could be “aggressive” in terms of putting across figures showing that things were “moving in the right direction”. Also at the meeting was Edward Lord, a member of the City of London Corporation, who attended at Mr Pursey’s request. As part of its investigation into lobbying for The Independent, reporters from the BIJ posed as agents for the government of Uzbekistan and representatives of the country’s cotton industry, to discover what promises British lobbying and PR firms were prepared to make when pitching to clients. Mr Pursey said his firm was working for the government of Azerbaijan, which he described as having “its own set of very complex issues” and appeared to revel in the controversial nature of his accounts. “We already work for other governments as well … Azerbaijan, Rwanda, we also do work for the Ivory Coast – the new one, not the old one . We also do work for – just started, in fact – the Movement for Democratic Change in Zimbabwe. Mr Pursey suggested setting up an internet site “like an Uzbek fact-check about the industry”, adding that he could also create attack sites aimed at critics. He said: “I think articles saying how marvellous everything is [is] jumping the gun because it’s not true and they [people] won’t accept it. So I think that things such as working through the internet, setting up things like an Uzbek fact-check about the industry, could be a resource for people online that could render better articles. Mr Lord said in a statement: “No payment or preferment of any kind was received by me, or any organisation I have involvement with, as a result of participating in the meeting, nor was any expected. During the undercover investigation into lobbying, 10 firms were contacted. Two of these, Morris International Associates and Ogilvy, immediately refused to accept the business from the Uzbek regime, which is responsible for grave human rights abuses. An hour-long meeting with Ann Morris, director of Morris International, where the undercover reporters tried to convince the company it should represent Uzbekistan, ended in a formal rejection. No official response to The Independent’s exposé yesterday was made by Morris International. But an account of the meeting by the Bureau of Investigative Journalism reveals that it took less than 10 minutes for the firm to make it clear that they were unwilling to take on the regime as their client. It was explained during the hour-long meeting that one ofthe requirements was online “reputational management” – to which Bell Pottinger agreed in its own meetings with the reporters. Morris International made itclear this was something theywere not prepared to engage in. The approach to a second firm, Ogilvy PR, never turned into an actual meeting. An initial connection was made by email and subsequently followed up with a telephone call. This lasted less than two minutes and the rejection of the request was quick and clear. The BIJ said that at no point did either of the two companies make it known that they felt a “sting” was in operation. Their rejection was based on what they were being asked to do. A public relations firm whose senior management have close links to the Liberal Democrats said it had created an internet ‘attack site’ for the government of Rwanda to counter accusations that it had been involved in genocide. Mark Pursey, head of BTP Advisers, was secretly recorded as part of the Bureau’s investigation into lobbying and PR, saying that the site was targeted at those who ‘over-criticised’ over ‘who did what in the genocide’. A 2009 report from the Commonwealth Human Rights Initiative said Rwanda’s ‘excellent public relations machinery’ had succeeded in hiding ‘the exclusionary and repressive nature of the regime’. Mr Pursey, who was head of the Lib Dems’ National Media Intelligence Unit during the 2010 election, suggested his firm could create a similar site for the government of Uzbekistan. Such a site, he added, could be ‘aggressive in terms of putting across facts and figures showing that things were moving in the right direction’. If I wanted an easy life I’d do PR for housing association. Reporters from the Bureau posed as agents for the government of Uzbekistan and representatives of the country’s cotton industry. In Uzbekistan, child labour is used in cotton fields to fulfil state quotas and the country also has a terrible human rights record. Mr Pursey said his company was working for the government of Azerbaijan, which he described as having ‘its own set of very complex issues’. As well as setting up an internet site ‘like an Uzbek factcheck about the industry’, Mr Pursey suggested the firm could also create an ‘attack site’ aimed at critics. ‘We haven’t written you a proposal or anything else but I think there are several things that we would want to do to start,’ he said. ‘I think articles saying how marvelous everything is, is jumping the gun because it’s not true and [people] won’t accept it. So I think that things such as working through the internet, setting up things like an Uzbek factcheck about the industry, could be a resource for people online that could render better articles. Mr Pursey also suggested recruiting Uzbek students, ‘a team of people who are genuinely, really blogging. It’s not fictional. It’s real.’ This group would be used to comment on an online article critical of the regime. He added that this could affect newspaper coverage. I think articles saying how marvelous everything is, is jumping the gun because it’s not true and they (people) won’t accept it. During the meeting Edward Lord OBE, a member of the City of London Corporation and Lord Kilclooney’s staff, was introduced by Mr Pursey as another partner in the business. Both men subsequently clarified that Mr Lord was not a BTP Partner and had no financial relationship with the firm, but had been invited by Mr Pursey to support him in making his pitch. Mr Lord has since said, with hindsight, he should not have attended the meeting. December 6, 2011 – The persecution of government critics can reach beyond Rwanda’s borders. We fear for the safety of other exiled journalists and government opponents in the aftermath of Ingabire’s murder. Daniel Bekele, Africa director at Human Rights Watch. (New York) – The Ugandan authorities should open an effective and transparent investigation into the murder of a Rwandan journalist on November 30, 2011, and identify and bring those responsible to justice, Human Rights Watch said today. The Ugandan government should also provide protection for Rwandan journalists and other critics of the Rwandan government who are living in Uganda, Human Rights Watch said. Charles Ingabire, editor of the online publication Inyenyeri News and a vocal critic of the Rwandan government, was shot twice in the chest as he was leaving a bar in the Bukesa-Kikoni Makerere area of Kampala late at night. Friends told Human Rights Watch that he frequently went to that bar and had gone there that evening to meet some friends. A spokesman for the Ugandan police told the media that the police had opened an investigation into Ingabire’s death and that two people were being held for questioning. The Ugandan police should explore every lead in the search for Ingabire’s killers and intensify protective measures for other Rwandan refugees, Human Rights Watch said. Ingabire, who was 31 years old, was a survivor of the 1994 genocide in Rwanda. He had worked as a journalist in Rwanda, but left in 2007 and obtained refugee status in Uganda. While in Uganda, he contributed to Umuvugizi newspaper, one of Rwanda’s most outspoken publications. Umuvugiziwas suspended in 2010 by the Media High Council, a Rwandan government-controlled institution. Jean-Léonard Rugambage, another Umuvugizi journalist, was murdered in the Rwandan capital, Kigali, in June 2010. Its editor, Jean-Bosco Gasasira, fled Rwanda in 2010 after numerous threats to his safety. After the suspension of Umuvugizi, Ingabire became the editor of an online newspaper, Inyenyeri News, which often published articles critical of President Paul Kagame of Rwanda and of the Rwandan government and army. Within a short time, the website appeared to have been infiltrated, and its contents suddenly changed, portraying the government in a favorable light. Ingabire’s friends said they suspected it had been taken over by elements close to the government. Ingabire and his colleagues moved Inyenyeri News to a new web location and it resumed its critical reporting. Ingabire confided to friends that he had been threatened several times in the months leading up to his death, they told Human Rights Watch. About two months before his murder, he was attacked and beaten in Kampala, and his computer stolen. The assailants – whom he did not recognize – told him they wanted him to close down his website. He also received anonymous telephone death threats warning him to stop writing articles critical of the government. While it is too early to draw conclusions about the motive for Ingabire’s murder, his death takes place in the context of a well documented pattern of repression of independent journalists, opposition party members, and civil society activists in Rwanda, Human Rights Watch said. Several journalists, critics, and opponents of the government in Rwanda have been arrested and detained or prosecuted in 2010 and 2011, and others outside the country have been threatened repeatedly. Rwandans living in Uganda are at particular risk, given the geographical proximity and close links between the two countries, Human Rights Watch said. Rwandan refugees in Kampala frequently report being threatened and followed by people they believe are Rwandan intelligence agents. Attacks on opponents and critics have also taken place further afield. In June 2010, General Kayumba Nyamwasa narrowly escaped an assassination attempt in South Africa. Nyamwasa is a former chief-of-staff of the Rwandan army and was once a close ally of Kagame, but is now an outspoken government opponent in exile. In May, two Rwandans living in the UK were warned by the London Metropolitan Police that there were threats to their safety emanating from the Rwandan government.